Here are my little heart croutons I made. I felt a bit like Lady's Home J., Julia, Sandra or Martha -esque making these croutons from day old stale bread. Home cooks from years gone by have made croutons for salads, soups (like French onion soup), stuffing, bread pudding, bread crumbs, but for me, this is the 1st time I have ever made croutons. I don't keep traditional American sliced bread in the house normally because I was not really raised on an American bread tradition, and I am not a grocery store sliced bread fan. Since I don't normally have bread in the house, I don't really have opportunity to play with stale sliced bread. When we do have bread in the house, it is usually tortillas, injera, naan, brick oven flat bread, or small quantity in a "bread basket" from Provence Bakery. The bread of Provence Bakery is made to be eaten during the day it is purchased, or else it gets stale and hard the next day because there are no preservatives or stabilizers in it. The day before I made these croutons, we bought a bread basket from Provence Bakery which includes 6 slices of the daily bread, and only used 2 slices. There were 4 slices left, 2 white and 2 whole grain. The next day, the 4 slices were stale, and it was going to be so wasteful to dump the bread in the trash. That is when I remembered I got cutest mini-cookie cutters from Pampered Chef. 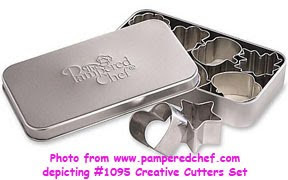 The cutters are about 1 inch in diameter (bite sized cutters, not large cookie cutters) and includes a heart, star, apple, maple leaf, pumpkin, and others. I thought to myself that making heart shaped croutons would be so awesome! I get to not waste food by using the 4 slices of stale bread, and I get to make the cutest croutons that I have ever seen! 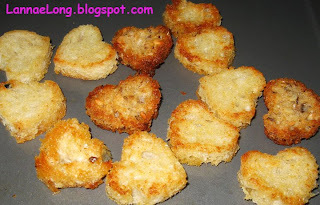 I took the heart shaped cutter and started cutting little hearts into the 4 slices of stale bread to make the croutons. I melted a little butter in some olive oil in a shallow pan. I dipped the bread hearts in the buttery oil to lightly coat both sides of the bread hearts. I put the bread hearts on flat baking pan and baked the hearts for a few minutes, than I turned them over and baked again for a few minutes to desiccate them to make them shelf stable. Yup, I think these croutons are cute! They were fun to eat to. There are a many food writers I like to read, but there a few food writers who are on the top of my list, and I seem to want to hang on their every word. Right now, the top of the list for me would be Ruhlman, Bittman and Pollan. I maybe be on their tweet, FB, blog, newpaper column, as well as videos and film. But, I have never had the opportunity to attend a lecture or seminar by any of them until now. I just discovered iTunesU, and quickly stumbled upon Pollan's kick-off lecture of his book tour, In Defense of Food, on iTunesU. It is free to download, and free to listen to. I am thrilled, I can now jog with his lecture in my ears! I love my iPod, I love to jog, and I love Pollan's food writing. Now, it is finally all coming together! What a great day for jog and a little Pollan! For 2008/9 New Year's Eve over a year ago, we got a late seating, and shared a City House New Year's Eve meal with some great friends and toasted with champagne at midnight, the first moment of 2009. That was a really nice evening over a year ago, and who knew that heart warming moment with dear friends was going to be one of the only few exceptionally good times of a really hard year for a lot of people including us. To recapture that feeling of good cheer and warmth of 2008/9 New Year's Eve, and say good by to the hard and exhausting year of 2009, I wanted to go back to City House, and then celebrate with some wonderful, upbeat and fun music of Old Crow Medicine Show at the Historic Ryman Theater. I really enjoy Old Crow so much, and going to their New Year's Eve show was perfect to say goodbye to 2009 and a hard decade, and hello to a new start of 2010. This past 2009/10 New Year's Eve we got a seating at 6:30 pm. We waited way too long to make a reservation, and the only times open were 5:30, 6, and 6:30. I would normally liked to have started dinner later, and go directly to the Ryman to hear Old Crow Medicine Show, but erring on the side of early was still fine with me. How City House offers New Year's Eve dinner is that there Tandy delivers EVERYTHING for the 4 course meal. There were 4 app course, 2 pasta course, 2 meat course and 2 dessert course, as served family style. All of that for only $49, is a deal if you ask me. To end 2009 slightly more "green" than I started, and because I knew the gig about the volume of food, I brought 4 reusable tupperwares with me, one for each course, for left overs. Bringing my own tupperware allowed me to start the year off right with less solid waste/trash, and less non-reusable and non-recyclable takeout containers restaurants offer. When I can remember, I will bring my own reusable tupperware. 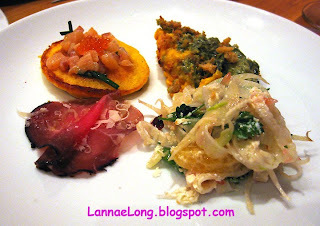 To start, we had air dried beef, smoked trout with trout caviar on an corn meal bellini, butternut squash with collards, and a citrus fennel salad with almonds. 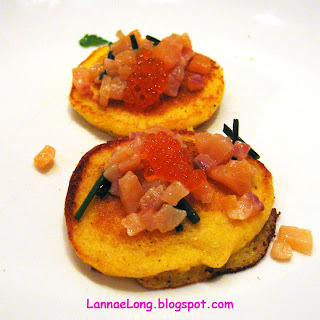 Matt liked the butternut squash and collards the best, and I liked the smoked trout over corn meal bellinis with the citrus salad as a close second. In 2009, we had way too many stressful events happen to get our wood smoker rig out, that we did not smoke food, bbq food, or grill food in 2009. Tasting Tandy's smoked trout, we are again inspired to smoke fish, make our own bacon, make our own pastrami again. We are looking at 2010 as being a better and more balanced year for us, and we can create some delicious Tennessee home smoked foods. We need a good local hickory wood or fruit tree wood source to start smoking up the smoker again. We don't need a lot, we don't need a cord, we just need a cut up fallen limb or two. Any suggestions? We both enjoyed the pasta. The duck sugo tasted like it was slow cooked all day long with a hearty and meaty demi-glace. I love the small pasta shells that came with the sugo. Pasta shells and pasta bowties make me really happy at a base level. It takes me back to when I was really little, like around 3 or 4 years old, before I was school age (my sisters are much older than I, so they were off in school), when my mom would make little pasta shells or bowties in homemade soup for lunch. Those are just great feelings and memories of sharing a pasta lunch with my mom during those S. CA days of my childhood. Thinking about it now, I think those lunches, just me and my mom, may have started my love of good food. We would have such a great time finding tasty treats for lunch like her soups, artichokes, sushi, falafels with tahini, avocados, Chinese noodles, duck, snapper soup, boiled peanuts, and a lot of other tasty treats. The meat course came with two dishes as well. The meatballs came with roasted cauliflower and a City House's version of a salsa verde. 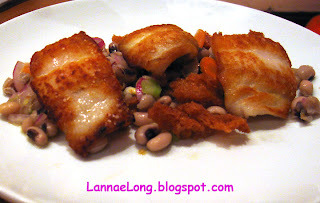 The fish was a Carolina fish with hoppin' john. The hoppin' john was a black eyed pea salad made with celery and onions. The meatballs, those are 1 of 2 reasons why we go to City House (the other is the wood fired oven belly ham pizza). In General, both of us don't love the various meatballs of our past. For me, meatballs of my childhood were little gray rocks with virtually no seasoning, no salt and all the fat rendered out of them. The frozen packaged meatballs are much worse with a strange spongy texture and fillers in them. Believe it or not, for the majority of my life, I thought I did not like meat and meatballs be I thought meat was a dry, acrid, string, leathery mess. It is not so, and City House meatballs are a meat product I really want to eat. We have had City House meatballs in many preparations. 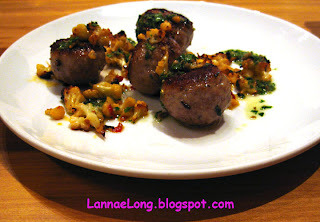 Over a year ago during the 2008/9 New Year's Eve dinner, we had milk braised meatballs. The low and slow milk braise transforms the milk into a deep rich brown gravy for the meatballs, and the milk keeps the meatballs tender during the braising. During the year, we have had meatballs with house made tomato sauce made with local organic heirloom tomatoes. We had these meatballs for 2009/1o New Year's Eve. For many Sunday Suppers at City House, Tandy offers meatballs as one of the family style dishes. I so enjoy Sunday Supper at City House. It seems that Tandy, sous chef, and line chefs let their creativity run, and they make a lot of fun dishes. Sunday Supper dishes are appropriate for a family style dinner, where each dish should be shared with the table, rather than Russian service. 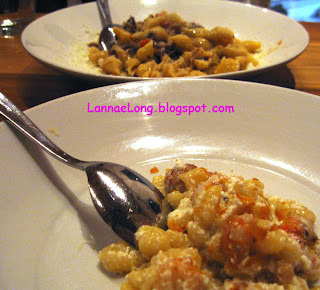 Most of the dishes are less than $9, so it is fun to mix and match. There is usually a meatball dish on the Sunday Supper menu, so I know where I can get my City House meatball "fix". I like many things about City House's Sunday Supper, and one aspect I respect is the Pork section of the menu. Tandy treats the whole pigs with incredible old world respect. He breaks it down himself, and uses every part of the pig for various dishes on his menu and Sunday Supper. He offers meatballs, head cheese, cracklin' skin, sausage, and salami among other pork products he makes. 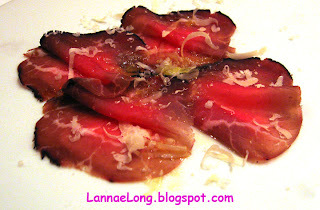 Some of the pork dishes on Sunday Supper seem experimental, and are fun to try. After eight dishes, there was the dessert course. 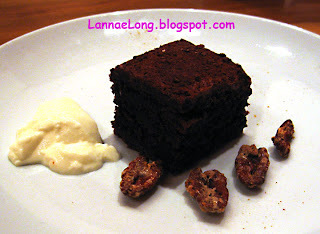 There was cake and panna cotta served house candied pecans. I like the panna cotta, and wish there were more. I am not a fan of pecans, nor cake, so I cannot judge whether they were tasty or not. I actually did not eat the pecans. I know, I know, I live in the south, and I must be the only person in the south who doesn't care for the pecan, taste, texture, nor look. I am also not a cake fan, never been. Even when I was a kid, it was torture to me to have to eat birthday cake, if it was not angel food cake. If you are a cake fan, and there is cake for dessert, come eat with me; you can have my cake share. I know, another strange thing, most people look at me and think it is weird that I don't like cake. I say, who cares! More cake for them that I am not eating! Back on blog post task, Happy New Year everyone! I hope it was a pleasure to say goodbye to 2009 and hello to 2010. It was for me. May 2010 be a happy, healthy and prosperous year!